← Tweet Tweet, what’s that sound? What can be sweeter than a home made Valentine’s Day card for a preschool Valentine’s Day party? Hand made Valentine’s written in Braille. What did I do to create these adorable sweet and simple Valentines? Step 1. On the unlined side of a 3×5 index card, I wrote in Braille, “Happy Valentine’s Day,” on the top left, and, “Love, Marley,” on the bottom right. Step 2. I measured, folded, and cut rid construction paper just big enough to glue behind the card, hiding the lined side of the card, and creating a red border around the white. Step 3. Marley placed tactile bubble heart stickers on the top right of the index card. Step 4. Marley glued the index card onto the red construction paper. Step 5. With a hole puncher, I punched two holes on the bottom left and tied a red bow. Step 6. Daddy wrote the same words in print on the back of the card. 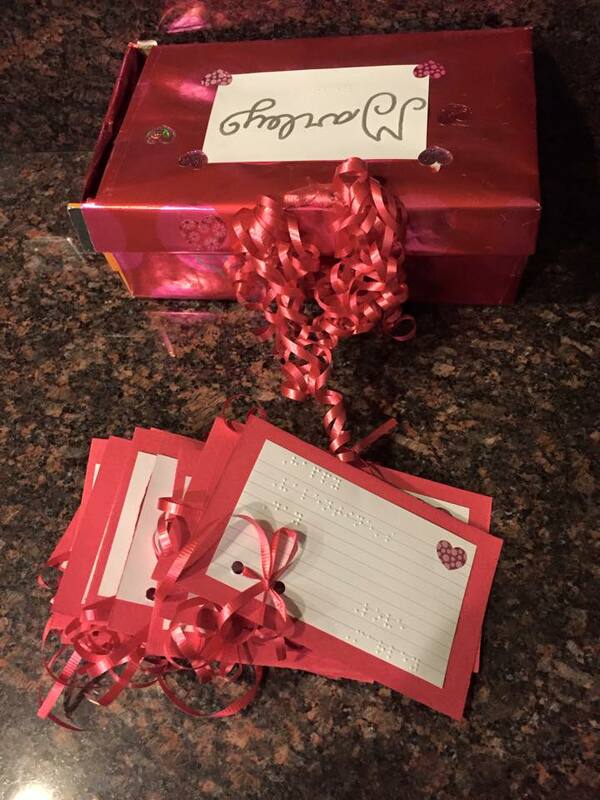 I thought about glueing Hershey kisses onto the card, or taping a heart sucker to the back, but decided against adding any extra sugar since I knew she’d be coming home with a box full of sweets. Posted on February 14, 2015 by MamaRupp	• This entry was posted in Uncategorized and tagged Blind, Braille, Card, Crafty, creative, fun, Marley and Me, Mom, preschool, Simple, Sweet, Valentine, Valentine's Day. Bookmark the permalink.